As those of you who have made San Joaquin Sourdough know, my procedure calls for a 21 hour cold retardation during bulk fermentation. The length of the cold retardation was taken from Anis Bouabsa via Jane Benoit (janedo on TFL). While I have often increased or decreased the 21 hours by 3 hours or so, I have been wary of a much longer time, because I feared proteolysis would result in unacceptable gluten degradation. This week, I did (finally) retard my dough for about 36 hours, partly for scheduling convenience but also out of curiosity. To my surprise, the resulting bread was hardly different than those I had retarded for 15 hours less. There was no discernable difference in flavor, although I had expected a more pronounced sourdough tang. The crumb structure was actually better, in my opinion. The crust coloration was unchanged. I would be interested in hearing about other bakers' experience with prolonged cold retardation of sourdough dough. 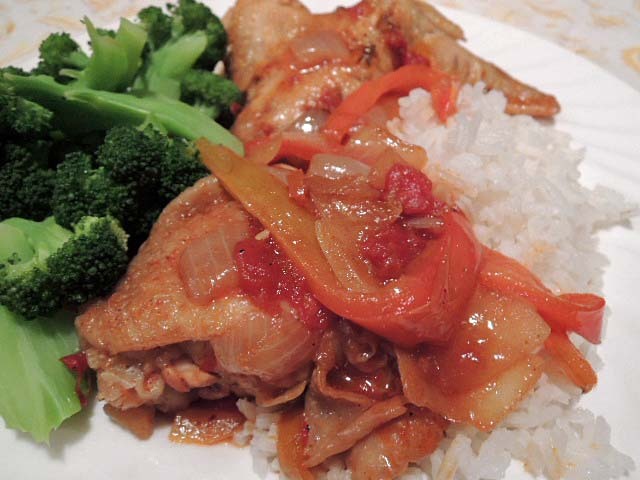 Our accompaniment to this bread was Chicken Paprikash. I'm always amazed by the ears you get on your bread. Lovely looking bake. I often do a cold bulk ferment for 2-3 days, as my work/home schedule is usually quite busy. This does make the bread a tad more sour, but not as much as one would think. Actually 36 hours is what I strive for with my sourdough pizza dough, makes for the most amazing bubbly open crackling crust. I'm quite afraid of any longer than 36 hours though, with the same worry you have. 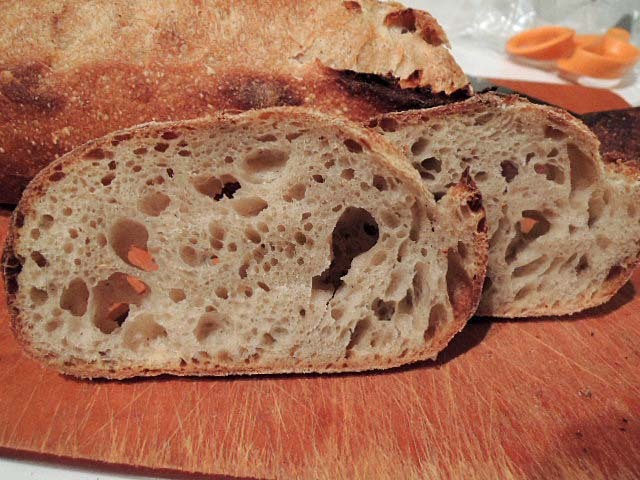 baybakin, can you please share your sourdough pizza dough recipe? Interesting experiement, David. Especially your comments about the taste and crumb. Was about to mix Txfarmer's 36 hour baguette formula, but didn't like the way the levain looked when I got home, so mixed another batch. Have never done a 36-hour fermentation. Your results give me hope! 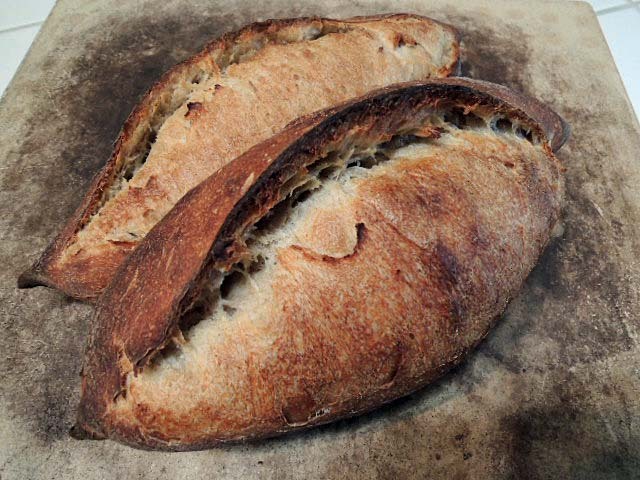 As always, your San Joaquin sourdough looks mouth watering. I've had a back and forth correspondence with Debbie Wink about proteolysis and sourdough in the context of a particular problem I was experiencing at work. One of the main learnings I've gleaned from our conversations is that because levain-based doughs ferment slower than those which have commercially yeasted preferments - poolish is what I'm referring to here - the enzymatic actions of protease are slower as well. Now, compound that by retarding your dough during bulk fermentation (as opposed to retarding shaped loaves), and I suspect that your dough isn't experiencing protease degradation to a noticeable degree over a 36 hour fermentation because you have really slowed down the entire fermentation process from the get-go. You're maximizing - I'm guessing - flavor development but minimizing gluten degradition at the same time. My suspicion is that if you instead did a regular bulk fermentation of, say, 2 hours, and then shaped and immediately retarded your dough for 36 hours you'd get a very different - and not so splendid - result. for a 90 minute counter ferment before being placed in the fridge in one big bulk. I'm not sure that a 30 minute longer conter top ferment would make any difference in dough degridation since the dough is being placed in the fridge in much smaller basket sized pieces. The smaller baskets and larger total surface area that results should cool the dough much faster in baskets than one large bulk and slow the fermentaion activity faster. I'm guessing that baskets would proof slower than the bulk as a result and dough should be better for it even with a 30 minute extra counter temperature ferment. I'm thinking that they would come out nearly the same. My basket retards seem to proof slower than a bulk retard with time being the same in the fridge. If there was no bulk ferment on the counter and it went right into the fridge then the bulk cold ferment could be better but how much? a very interesting experiment and baking using Ying's 36 hour method. I'm surprised that isn't more sour since this flies in the face of Dough,doc spreadsheet that say's the lab to yeast ratio should be in the 3's at a low temperature and sour should become more pronounced the longer the bough is cold all things being equal. I certainly noticed the sour increase with long counter top ferments where the lab to yeast ratio is also in the 3's. Was the dough fully proofed when it came out of the fridge or did you let it warm up and proof after it came out like you do the 15 hour retard? Your result baffles me. Great looking bread inside and out though and that is all that counts. I find that cold fermentation increases sourness when it's the levain or the formed loaves that are retarded. I don't find this when I do a cold retardation bulk fermentation. I would guess that this difference is due to the concentration of LB available to produce acids. I'd be interested in Debbie's view. DaBM: The dough is bulk fermented at room temperature for about 2-3 hours before going into the fridge. Usually, there is very little dough expansion in the fridge. My SJSD procedures call for dividing and pre-shaping then resting at room temperature for an hour. Then shaping and proofing for 45 minutes before baking. Bread and accompaniment both look delicious, David! I agree with your comment above regarding retardation and concentration of LB available to produce acids at different stages in the breadmaking process. I know you've just recently retired, David, but do you feel that your appreciation for bread baking has changed now that you (perhaps?) have more time to spend on it? 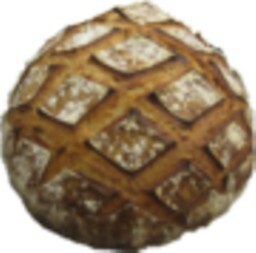 All the best, David, and once again: Wonderful bread! Regarding retirement and bread baking: I'm not sure my baking has re-equilibrated yet, but my observation has been that I am not baking more in total. However, I had been baking 3 or 4 different breads on a weekend and eating most bread after it had been frozen and thawed. Not ideal. Now, I can bake 1 to 3 times per week and eat fresh-baked bread most of the time. This is a big improvement. Also, just in the last week, we had friends over for dinner two nights, which I couldn't have managed while still working. Of course, I was able to serve fresh-baked bread for both dinners - a SFBI miche for one and Hamelman's Pain au Levain with Whole Wheat for the other. I wouldn't want to predict how this pattern might evolve, but, so far, I'm enjoying the changes. I have recently changed my formulas and schedules to allow for a retarded bulk ferment of my fresh milled breads. Not only can I control the fermentation better during summer but the flavour is also really pleasing - especially the wholewheat desem. About 12hrs - 16hrs is what I am aiming for in the fridge after one hour on the bench. After the cold bulk ferment I give them a short, warm and humid proof and have gotten really great lift compared to just room temperature proofing. Is the "great lift" you described oven spring? If so, it could just be that your loaves are less fully proofed with your new procedure. I have heard anecdotes about proofing wholewheat breads (mainly desem) at warmer temperatures for shorter periods. Apparently the theory is that the gas loss occurs from bran puncturing and that a short warm proof will allow the bread to rise quicker than gas loss occurs ... I have seen some improvements ... but again, its only anecdotal and I really don't have the evidence to back it up at this stage ... I think the best outcome for retarding in bulk for the desem bread is the flavour and crumb quality ... the wholewheat really needs that long wet time in bulk. I remember you wrote sometime ago that your fridge runs nice and cold. And if you are baking more regularly perhaps you are making smaller quantities. If so, your fridge will not struggle to maintain that really cold temperature to effectively retard your dough. The fridge in which I cold retard runs at 40 dF. It is in my garage and is a heavy duty fridge made to deal with temperature extremes. My retarding dough/loaves don't even make it breathe hard. David, I've been admiring your San Joaquin Sourdough iterations for quite a while now, and I think this one is the most beautiful yet! This batch has inspired me to finally try your formula, I have some retarding in the fridge right now. Do you have any special trick to getting that amazing ear and grigne? Other than perfect shaping, baking at the perfect time, perfect scoring and perfect gluten development? Hmm, guess I answered my own question :) Fantastic work! I hope you enjoy your SJSD. The chicken looks yummy too. Thanks for sharing - well done! This is a beautiful bread - glad to see your success with the long, extended cold fermentation. Thanks for your post - it's always so nice to see the results of your experiments. The comments are interesting and helpful, too. I took a cue from Phil's comment and tried an 18-hour cold fermentation and short, warm proof for a recent bake and was happy with the result. I love those ears, mine are never that good! A 72 hour retard was a little limp, but still not bad!